I finished the border on Sea to Shining Sea yesterday. Now I just have to wait for the last block to come out and I will be done! I also framed "Queen Bee" this morning. I've had it just sitting in the frame for a couple months and I finally got around to lacing it around the foam core. I usually use pins, but thought I would try lacing this one since it's small. I painted the frame a dark charcoal gray a while back. I think it turned out pretty cute. Well, today is "Kind Fond Love Sampler" day. I'm doing pretty well on my rotation so far. Hopefully I'll be able to stick to it! :) Write soon! I love Sea to Shining Sea and that bee is adorable. I may have to get the bee!! It looks really cute in the frame you painted!! I wish I were as good at the finishing! I need to do my Sea to Shining Sea. I am getting them from Amy though! I love queen bee! great job on the frame as well! Beautiful job on both projects! I have decided to stitch my Sea to Shining Sea over 1...commit me now!!! Both pieces look beautiful, Nicole. You'll be finished with Sea in no time. Your framing looks wonderful too. Continued luck on your rotation. Your Sea to Shining Sea looks great!! YGG! You'll be done in no time. Queen Bee looks fabulous--I love that frame for it. Great job! The frame that you painted is perfect for it. I knew I forgot to say something & was thinking about it as I grocery shopped this morning, LOL... your charts from the Charleston Museum are wonderful! I have an A&E WIP from them, Dorothy Ians. Also, did I ever tell you that my neighbor lives in Mt. Pleasant? She has since moved back to the US but kept her house here and comes back every few months for a week or so at a time. Small world, huh?? I'm not sure exactly where in Mt. P that she lives, I'll ask her next time that I see her. Sea to Shining Sea is absolutely beautiful. You are doing great with it. Queen Bee is lovely too. Sea to Shining Sea looks great! 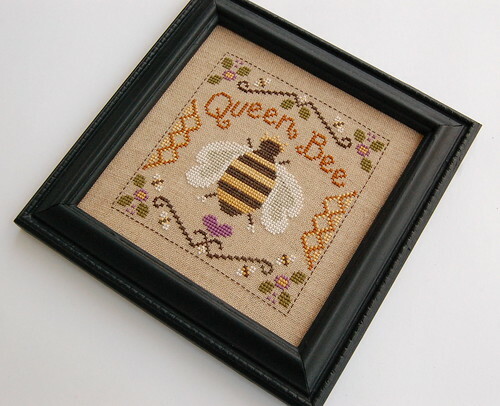 And I love the frame for Queen Bee. Do you use glass on your framed pieces? The Queen Bee is just beautiful!!!! Sea To Shinig Sea looks fabulous. Great framing job on Queen Bee. Nicole, you are such a fast stitcher! Love seeing your progress. The Queen Bee looks great all framed up. But I especially like seeing your progress on HoHRH. I did the Village, but not the houses....I DO like them tho! Your framing is really sweet. You did a good job! I'm glad your rotation is working for you. I have a WIPS and CR baskets and what I have going for me doesn't work. However, I saw yours and thought how simple you've made it. I hope you don't mind, but I've decided to adopt your approach to the day-to-day rotation. I think this may work. I have 12 CR's and 5 WIPS, and some are big projects. The way I have things, it just isn't going to work. Your way seems so simple and I love lists, especially to-dos. I hope you don't mind though. I may mention this on my blog, but I will DEFINITELY reference your blog and give you ALL credit for the way you've tackled it. Thanks for inspiring me, Nicole! Sea To Shining Sea is looking good, Nicole. Bet you can't wait for that last block to come out? I love your framing job of Queen Bee. Looks so professional . Well done! Queen Bee is gorgeous, great framing and Sea to Shinning Sea looks lovely. what is the name of that blue fabric? The more I look at it, the more I love it! A beautiful framed piece and a lovely wip. I love the Sea to Shining Sea project, nad what I love most on it is the mountain section. Queen Bee looks very good in its frame! I love Sea to Shining Sea. And Queen Bee turned out wonderful! I love the framing. Every time I Sea to Shining Sea on that blue fabric, I want to stitch it!! I love it!! And how adorable your Queen Bee is! What a nice framing job you did! You're making so much progress on all your projects, Nicole.